There are plenty of movies to watch that are all about Christmas, and much as I love great classics like It’s a Wonderful Life (1946) and A Christmas Carol (1951), my favorite Christmas movie — Mixed Nuts (1994) — is rather off-beat. So maybe it’s not surprising that at this time of year I often think of the movies that aren’t about the holidays, but merely include them. They use Christmas to enhance the story. Instead of putting Christmas on a pedestal, they weave it in as part of everyday life. Serendipity (2001): In this love story, Christmas is a catalyst. While shopping for presents, Jonathan (John Cusack) and Sara (Kate Beckinsale) meet and fight over the last pair of black gloves in the store. Jonathan is attracted to Sara, but she believes in fate and signs, and they are both already dating other people. After spending a few bewitching hours together, Jonathan agrees to Sara’s plan: to let the universe bring them together if that is their destiny. Years later, both are engaged to others but still dreaming about that magical meeting and they each start a quest to find out if maybe they didn’t pass up the perfect partner. The movie ends at Christmas time as well, back in the same store, at the same counter, to wrap up this charming film. 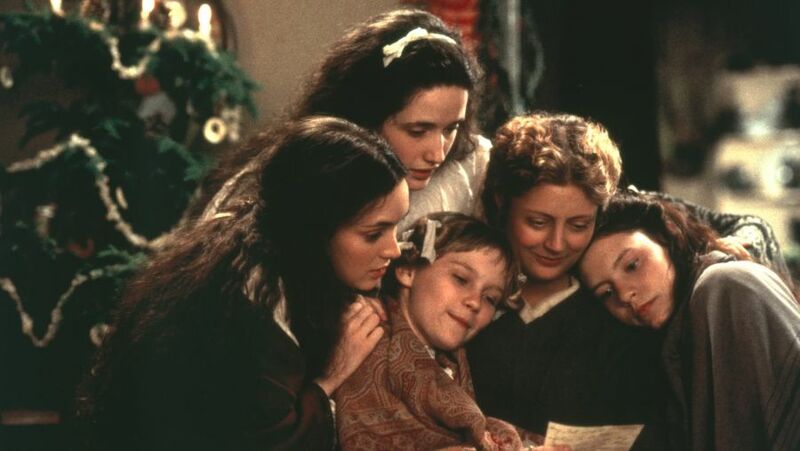 Little Women (1994): The story of the March family, based on the Louisa May Alcott book, looks at life in New England after the Civil War. Jo (Winona Ryder) is a passionate, imaginative girl in a world that still holds women back. With her mother’s support, she takes the road less traveled, determined to become something more than “just a wife”. Of course, her heart disrupts her plans. Opening with a Christmas where the poverty-striken Marchs long for the old days, the movie also includes a joy-filled home-coming on Christmas Day. While You Were Sleeping (1995): This romantic comedy starts shortly before Christmas and ends just after New Year’s Day, so holiday celebrations are central to this movie without taking over the story. Lucy (Sandra Bullock) is a lonely subway worker, only fantasizing about the handsome stranger (Peter Gallagher) who comes to her booth until one Christmas day when he gets mugged and she saves his life. At the hospital, she meets his family who believe she is his fiance SYMBOL. Since he’s in a coma and she can’t bring herself to tell them the truth, Lucy enjoys the love and companionship of a family for the first time in ages. Then Jack (Bill Pullman) comes along, and Lucy finds herself falling for Jack when she is expected to marry his brother. The warmth and humor of family Christmas comes through when Lucy joins the Callaghans to celebrate the holiday. Trading Places (1983): Dan Ackroyd and Eddie Murphy are wonderful in this comedy about a financial tycoon and a street hustler who wind up in one another’s shoes. The unwitting victims of a bet between two heartless millionaires, Louis Winthorpe (Ackroyd) and Billy Ray Valentine (Murphy) struggle to survive in an unfamiliar world until they realize what is going on and turn the tables on the men toying with them. Director John Landis uses the holiday season to help underscore his visual commentary on economic differences in Philadelphia in the opening sequence. An office Christmas party and a slob Santa play prominent roles, and Jamie Lee Curtis decorates a Christmas tree. Meet Me in St. Louis (1944): A nostalgic musical about the World’s Fair of 1904, this film includes both Halloween and Christmas as it follows the Smith family through a full year of life in St. Louis. Teen-aged Esther (Judy Garland) is desperate to fall in love and sets her sight on the boy who has just moved in next door. Esther is both sweet and silly as she tries to attract John’s (Tom Drake) attention but just when things are finally going her way, Esther’s father tells the family they are moving to New York. 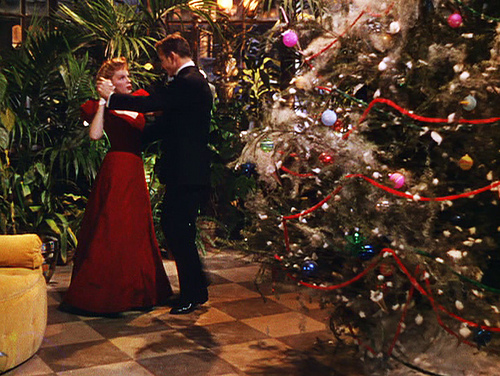 A Christmas ball is the climax of the movie and Garland sings the most poignant version of “Have Yourself A Merry Little Christmas” that I have ever heard. 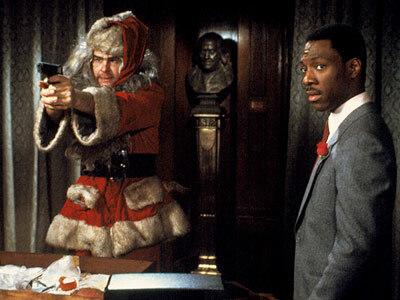 Do you have a favorite movie that includes Christmas without being about Christmas? Please tell me if I’ve missed any!